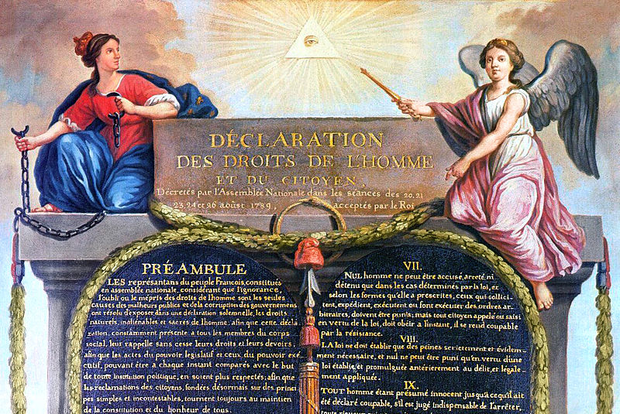 On August 26th, 1789 the French national assembly proclaimed the Declaration of Human and Civil Rights. It became one of the foundational texts for democracy and freedom in the entire world. The “Universal Declaration of Human Rights” that came out of the French Revolution applied to people who were, in concrete political terms, in the process of becoming citizens from subjects. As subjects people were property, now they were gaining autonomy. The Monarchy revolved around the monarch, the Republic around the citizenry. At the center of the world, the Divine Right of rule disappeared. In its place came the belief that every person was endowed with inalienable rights that defined their humanity. Are Europeans then today citizens or human persons? Human rights mean in the general perception more than civilian rights. Civil rights are a spill over of the more deeply embedded human rights. Human rights apply to people universally: civil rights to those in states, whose legislators, executives, and judicators are committed to human rights. These general ideas begin to break down in the definition. For the assertion of innate, inherent characteristics, values, and rights only worked in a world whose foundation was formed by metaphysical and religious ideas. The recognition of human dignity and the exclusive status of the human being in the present day is achieved through, usually implicitly, the Christian idea of man. The American Declaration of Independence is the godfather of this development: there it’s stated that man has been endowed by his creator with inalienable rights. The mythology of human creation has been furnished with a national-political narrative that to today that claims its validity. Many European constitutions, including the German one, invoke God in their preambles. The German people, so it says in the German Constitution, adopt this constitution with the responsibility they share before God. From the preamble to the first article of the legislative text there’s only a small step: “Human dignity shall be inviolable. To respect and protect it shall be the duty of all state authority.” The Constitution dates from the year 1949 and was written in the terrible presence of the holocaust and the devastation that began in Germany and panned out over half the globe. The total renunciation of people of every type of humanism led the mothers and fathers of the German constitution to the return to the Christian narrative that the dignity of man is set to a divine command and escapes discussion for all of time. The Constitution ends with the “Eternity Clause”, which by definition stands in the world of the divine and does not bear witness to the fact the legislative text is a technocratic creation. Materially, this clause professes, among other things, that the first 20 articles of the Constitution are impossible to alter. The Nazis had disavowed any body of law, through dressing up their racial ideology in legislation that imposed a burden on every dutiful member of the state, or served as an apology for what they would set out to do, and was implemented in the community like any other law. The question: if a person is truly a person, should never again be allowed to be legally embellished. Through the contemporary historical experience that saw the devaluation of human life, it was plausible for the human being to be recognized as sacrosanct, and the claim itself to be self-evident: like how the American Declaration of Independence was plausible to the ears of its time. The question about the essence of the claim of human beings is no more self-evident than it may have been to previous generations. In the philosophy of the West, man has lost at latest in the 60s of the past century his metaphysical shelter. For some this is the end of history, for the human being has lost­–with his place in a salvational history understood through a progression of events–his very destiny. The end of history wasn’t first claimed by Francis Fukuyama in his well-respected essay with the same name, rather by Jean-François Lyotard, who formed the concept of post-modernism and asserted precisely this break with every classical interrelated thesis and antithesis. As atheism seeks to face off against theism, it continues the presuppositions of theism, merely reversed. The present age of postmodernism and the deconstructionism experiences the relativity of every assertion – because through making the opposite assertion one does not dissolve the original, rather they spin out towards infinity, without delivering any proof. If a citizen and a human being are interdependent and mutually affirm one another, the knowledge gained comes to zero and the question to the essence of man must be answered beyond until now known assertions made of his nature. Postmodernism and deconstructionism are flanked by the insights made in linguistics made by Paul Searle and John Langshaw Austin (the so-called linguistic turn) and the philosophy of language of Ludwig Wittgenstein, that human language can only still be understood in its utilization, or in the form of family language and language games, which (still) are understood in certain contexts, however not more than as all the participants of a language community. Now Babylonian language tangle of the Bible had also found an intraworldly pedant. These innovations – until this time the philosophers have moved away from the notion, that the child through its growth discovers language in itself – are still anchored today in general worldview, but without all the consequences taken out. How long such a process should last, we see in the linguistic application from “the sun rises” and “the sun sets.” We’ve known since the time of the Copernican revolution that neither is the case, but our language still after 400 years has not taken this scientific insight into account. The linguistic mix-up of citizen and human that Chancellor Merkel committed is an intraworldly language confusion. Metaphysical humans don’t exist any more, well, perhaps Merkel had just not been able to say that all citizens of the world, who through their mere existence, through their arrival into this world, are becoming housemates. The ethics of Christianity and the teachings of Existentialism meet here: a human being lives with all other humans in a habitat that is to be safeguarded for the humans that should come after this generation. The system’s preservation becomes the highest imperative: a system that has been given by nature and not some divine settling, that in the work of a life span wants to live and not stop living. Also this may be an assertion that one can counter with another argument. But it is in this self-validating theistic assumption that searches for an intraworldly connection for justification. This housemate existence, which is passed on from generation to generation, may also be the telos, the goal to be understood, that moves always forward through space, without ever attaining a “real” goal in the sense of Christian salvation. Every generation must decide on the values that connect them with their housemates and make them plausible in the context of their own lives. Tolerance, humanity, and empathy are not hereditary, only learnable. So each generation is in itself a goal, because they will have enough set out for them, not to tear apart the links that bind them their fellow housemates, both current and still to come. This worldview has of course implications for humanism. Erich Fromm, in his work “To Have or to Be” in the interim period between existential philosophy, postmodernism, and deconstructivism hinted at a deciding point, which corresponds to citizens or humans. “I have a body” is the opposite expression of “I am in a body.” The first sentence points towards people in the progress paradigm that the modern age has created: a notion that is founded first in the creation through the planet’s natural resources. The “I am in body” on the other hand refers to the Here and Now, in which the human cares for him- or herself and his or her relationships to others. One must have a body in order to be able to be inside of it, precisely like how one must first be a human to possess the rights of a citizen. But is one then really a human in this world without these rights? And what is the body if it is only to be used vegetatively, without ever truly being? The Thomistic, Christian worldview was based on that-ness and such-ness. The that-ness refers to the concrete human with its mistakes and in its temporality, the such-ness of a human, as it furnishes its God and its telos. The that- and such-ness are fused in a person’s being, just like what becomes of the concepts of humans (that-ness) and citizens (such-ness). That man is halted in its having and does not open into being is probably getting at the Christian analogy, an original sin for post-metaphysical man. When the humanity’s telos is henceforth only found in the world, on what spiritual sentiment is being a human then endorsed? It is clear that the spiritual experience is and remains capable of truth, be it through the spiritual paths of the “established,” “classical” religions, like Christianity in Europe, or be it in new ways that connect to the wisdom and practices of the Fareast. A happy life was the goal of the ancients: which always implied bliss as well. The Latin word beatus is translated with these two concepts. Happiness and bliss was, for those who came before us, often unthinkable without metaphysical components. It is also today for many people still unthinkable, but rather is bound to a component that thinks over ones own historicity in posterity, in which there is punishment or rewards for action or omission. For Europe Elias Canetti already attested with his still topical work “Masses and Power” from the year 1960, that people no longer believe in an afterlife and that mobilization through Christianity is no longer possible. Also in the USA meanwhile there is a multitude of young people surveyed that affiliate with no religion. It seems that this finding, which Canetti already knew about in the 1960’s in Europe, is now also beginning to apply to the United States. What if we can no longer achieve bliss? Then we’re talking, in turn entirely intraworldly, about a successful life and mean by it one in which a human being has fulfilled his or her role and his or her duty as a fellow housemate.